Is Hawaii on your bucket list? The good news is there are no bad choices! All of the Hawaiian Islands are lovely, and each has distinct features. I have visited three, Oahu the most recently. Oahu is the most populated island, and it is where Honolulu is located. Famous for Pearl Harbor, the North Shore, Diamond Head and Waikiki Beach, you’ll find something for everyone on Oahu. You certainly feel you are on an island, but have every possible convenience available, from high-end shopping and upscale restaurants to local food trucks. Getting around Oahu is easy, and you won’t even need to rent a car if you don’t want to. All of the tour companies will pick you up at your hotel and get you to your excursion; they really have it down to a science. If you just want to drive around the island and explore on your own, I’d suggest renting a car just for the day. Most of the major hotels, such as the Hilton Hawaiian Village on Waikiki, have a rental car agency desk on site. It has a higher-per-day price tag, and keep in mind that parking is pricey at close to $50 per night. Another option is Uber or Lyft; they’re everywhere! The best mode of transportation for the least amount of money is TheBus. You can go just about anywhere on the island using a one-day pass for just $5.50 for adults and $2.50 for kids ages 6-16. Kids five and under ride free! The dining options on Oahu are as diverse as the population! If you want to try a local staple, have a poke bowl, which is made up of raw, marinated fish (typically tuna), rice and a variety of vegetables. You can find poke shops everywhere, including gas stations! My favorite upscale restaurant is Nicos Pier 38. It was recommended to me by a good friend who grew up in Honolulu and is a local favorite. In the heart of the shopping district of Waikiki, you’ll find Tommy Bahama. The rooftop restaurant and bar is a great place to hang out, and the food was outstanding. For a fun food truck, go to the beach by the Hilton Hawaiian Village (think Hawaii 5-0!) The garlic shrimp is fantastic. The best breakfast we found was at Cinnamons in the Ilikai hotel on Waikiki Beach. Oahu has so many resorts that it can be mind-boggling, but it’s important to keep in mind that they are NOT created equal. Make sure you read the fine print about location. Waikiki Beach can refer to an area as well as the actual beach. The Hilton Hawaiian Village is on the beach, but it is a large complex of buildings, restaurants and shops. Even if you aren’t staying there, be sure to go on Friday night for the fireworks show on the beach. For a quieter stay, find a resort outside of Honolulu. 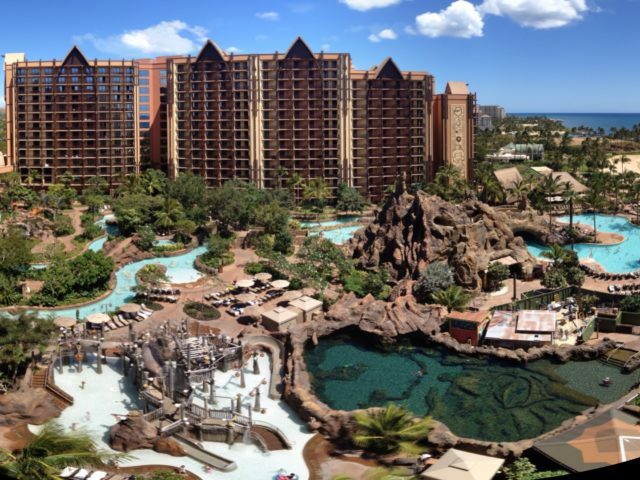 Just 30 minutes outside of the city in Ko Olina beach, you will find Aulani, A Disney Resort and Spa. It is simply amazing and family friendly with some Disney touches such as character meals and photo ops. Even if you are not traveling with children, you might enjoy Aulani as they have several adult-only areas and a world-class spa. Also, nearby in Ko Olina is a 5-star Four Seasons Resort which features golf and tennis. If you are thinking about going to a traditional Hawaiian luau, I would recommend going to the Polynesian Cultural Center for a more authentic experience. While they are still fun and convenient, the luaus in Waikiki are typically performed on rooftops, not beaches. If you stay on another island, but really want to see Pearl Harbor, it can easily be done. My recommendation would be to spend one night in Honolulu either on the way in or on the way out. Flights between islands are frequent and inexpensive. I have stayed on Maui several times and it is my favorite island. It has a natural beauty that just about can’t be matched anywhere in the world, from beautiful beaches to lush tropical rainforests and waterfalls. My favorite resorts are at Wailea Beach in South Maui, specifically the Fairmont Kea Lani and the Grand Wailea. South Maui is renowned for its golf courses and beautiful beaches. If you time your trip right, you can attend the Maui Film Festival or see migrating humpback whales. Another popular area is Kaanapali Beach in Northwest Maui. Kaanapali was a favorite retreat for Hawaiian royalty. Whalers Village is a must-do for those who want to experience authentic Hawaiian entertainment and culture, world-class shopping and exceptional dining. You can even watch the cliff diving ceremony at sunset. Additional Maui highlights include watching the sunrise over the crater at the top of Mt. Haleakala then biking back down the side of the volcano, visiting the historical town of Lahaina and taking the Road to Hana. Hana is only accessible by the Hana Highway, a 52-mile drive that takes you over 59 bridges and around 620 curves and hairpin turns. You’ll discover hundreds of photo ops along the way, and at the end, you get to experience its black sand beaches. A Maui vacation can be as active or as laid back as you wish. Unlike Oahu, it’s probably best to rent a car or Jeep while on Maui in order to experience all that this island has to offer. Hawaii is the largest island in the Hawaiian Island chain. It is so large and diverse that one can travel through several climate zones from Wet Tropical to Polar Tundra. Opportunities for fun include getting up close and personal with flowing lava at Hawaii Volcanoes National Park, walking through a rainforest, discovering beautiful waterfalls or visiting the black sand beaches. The Big Island is also home to many farms and ranches (think Kona coffee and macadamia nuts). The Kona district is a popular place to stay on The Big Island. Stretching across almost two-thirds of the west side of the island, it is the place where Captain James Cook first landed in 1778. Kona has much history to be explored and fun to be had. The waters off of the coast of Kona are ideal for snorkeling, being home to a variety of ocean life such as honu (Hawaiian Green Sea Turtles) and dolphins. Deep-sea fishing is also a very popular activity on this side of the island. In August, Kona is host to the International Billfish Tournament. Hilo, in the Puna region, is a commercial center and boasts many museums, galleries, restaurants and the Hilo Farmers Market, which is open seven days a week. Around Hilo, you can also find natural beauty such as waterfalls, blooming gardens and rainforests. For golfers, a visit to the Kohala Coast is a must. There you will find some of Hawaii’s finest golf courses and resorts. Other Kohala highlights are its white sand beaches, a petroglyph archaeological preserve and the Puukohola Heiau National Historic Site. The Big Island is also best explored with a rental car. Hawaii is most definitely a place everyone should have on their bucket list! For more information or to get a FREE quote for a Hawaiian getaway or any other vacation, contact Small World BIG FUN! « 20 Years as a Travel Agent—This Is the Most Amazing Trip I’ve Taken!